Početna Ostalo On-line ordinacija The Cold Theory: Do you trust your fridge ? In view of the observation that CD is linked to a familial environment risk factor related to western lifestyles, domestic hygiene, diet and infectious agents, the researchers proposed a specific candidate for the development of CD: The refrigerator.. Inflammatory bowel disease (IBD) affects millions of adults and children around the world and finding its cause remains one of the greatest challenges in medicine today. The chronic and relapsing nature of the disease has a significant impact on a patient’s nutritional condition. More than half of the patients may present malnutrition and a wide range of nutritional complications. The presence of unexplained gut inflammation has inevitably led researchers to try to identify factors in our diet that may trigger, or even cause IBD, but no specific dietary component has been identified so far. There are two major forms of IBD: Ulcerative colitis and Crohn’s disease (CD). CD is more common in Europe and North America where incidence has risen in the last 50 years. It was initially suggested that the adoption of an urban lifestyle may lead to an increase in the incidence of IBD since many crucial changes occurred from the first to the second half of the 20th century with respect to food, housing, transport, leisure and clothing. It was already known that CD was a result of an excessive response to pathogenic bacteria in genetically predisposed people. Several infectious agents have been proposed to be involved, including species of Mycobacterium, Listeria, Yersinia and Escherichia coli but none has been proven as a causative factor. Few days ago, researchers from the Laboratoire de Génétique des Maladies Inflammatoires del’Intestin and from the Department of Pediatric Gastroenterology of the INSERM (Paris, France) postulated a very interesting hypothesis to explain the cause of CD. In view of the observation that CD is linked to a familial environment risk factor related to western lifestyles, domestic hygiene, diet and infectious agents, they proposed a specific candidate for the development of CD: The refrigerator. The same group of experts who actually discovered the main gene related to Crohn’s (called NOD2/Card15) in 2001, now believe that the advent of domestic refrigeration contributed to the outbreak of this disease in the 20th century. Domestic refrigeration began in the 19th century, when the first machines were built around 1875. The first domestic refrigerator was developed by Kelvinator in 1918 in the USA. It became more popular and by 1937, almost half of Americans had a refrigerator. In 1930’s Europe, only wealthy families had refrigerators and ownership became more common only after World War II with improving in living standards. Even in 1958, only 10% of French and 12% of British families had a refrigerator –ownership was as low as 2% in Spain, the USSR and Japan. The European exception was Sweden where at the same time just over half of the families had a refrigerator developed by Electrolux. Population-based data suggest that the increase in prevalence of CD was in the 1940’s or before in the USA, in the 1950s or before in Sweden, in the 1960s in the UK and later in Southern Europe. These examples show geographical coincidences between the development of the refrigerator and the outbreak of CD. The new hypothesis points to the existence of bacteria capable of surviving or developing at low temperatures. Such microorganisms, known as psychotrophic bacteria, have optimum growth at temperatures higher than 30oC but are able to grow, at a slower rate, at temperatures between –1oC and 10oC – ie, the temperature inside refrigerators. The most frequently encountered psychrotrophic bacteria with pathogenic properties are Listeria monocytogenes, Yersinia enterocolitica, Clostridium botulinum and Bacillus cereus. CD lesions occur predominantly where there are lymphoid follicles, in the small bowel where they are grouped forming “Peyer patches” and in the colon where they are isolated. It is in these follicles where psychotrophic bacteria can trigger an inflammation cascade responsible for lesions of CD. From a historical perspective, the three main mutations of the Card15 gene associated with CD in white people have probably occurred only recently in human history. There were large outbreaks of plague in Europe between the 6th and the 14th century that might have provided carriers with a selective advantage during plague outbreaks and therefore it could be postulated that mutation carriers have a more intense reactions when exposed to Yersinia. With time, Y pestis (responsible for the plague outbreaks) was replaced in Europe by less pathogenic strains such as Y pseudotuberculosis and later Y enterocolitica . However, the intense reactions against Yersinia developed by mutation carriers might have become inadequate for these less virulent strains. Y enterocolitica was isolated for the first time in 1934 in the USA, 2 years after the complete description of the discovery of CD by Crohn, Ginzburg and Oppenheimer. In Europe, Y enterocolitica infections increased after the 1960s, the same time as the CD disease outbreak. In addition to the temporal coincidence of CD, a geographical relationship also exists: Yersinia are more common in northern countries. In summary, these researchers propose a link between CD, domestic refrigeration and chronic infestation of the digestive tract by psychotrophic bacteria. Their model provides a structured and unified explanation, based on biological evidence and a network of statistical relationships. However, much more testing is needed before this model is accepted or discarded. The “Cold Theory” for the development of CD cannot be limited to the domestic refrigerator, which is the last part of the cold chain. The cold chain is much more complex: for example, of the 520 kg of food eaten every year per person in France, 320 kg are, at some point, conserved at a low temperature. Furthermore, external factors could affect the quality of the cold chain including machine maintenance procedures, food handling-processing and the availability of electricity. The cold chain has produced many benefits for western societies, including the prevention of enteric infections, allowing people to access a well-balanced diet and hence, better nutritional habits, and the economic development of agriculture and fishing. These advantages clearly outweigh the risks mentioned above and in the absence of solid experimental evidence, no practical conclusions should be extracted from this new hypothesis. 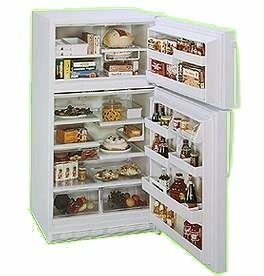 Perhaps future refrigerators in the new millennium will include some sort of anti-bacterial light or a similar device to keep our food safe from bad bugs. Science needs to take a closer look to what we have inside our fridge for sure…. Reference : Hugot JP, Alberti C, Berrebi D, et al. Crohn’s disease: The cold chain hypothesis.